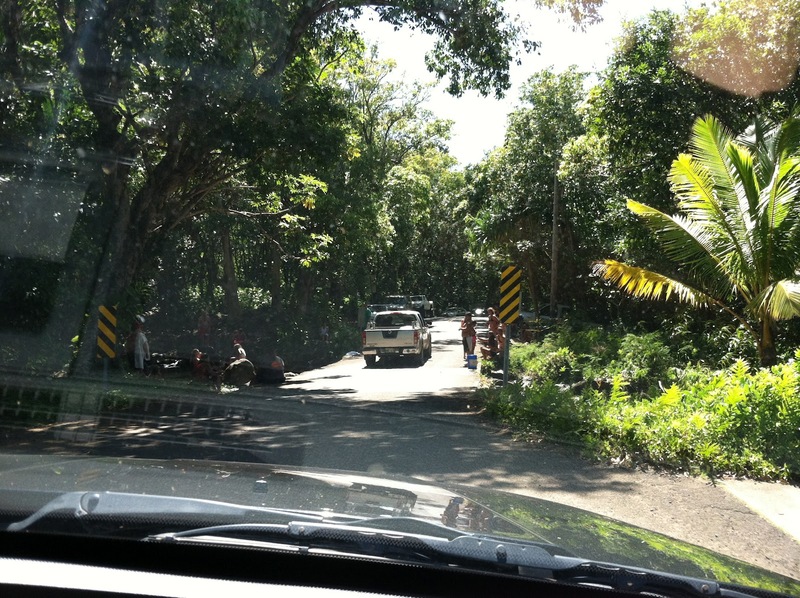 Pali Ke Kua #4 – Literally a blessing in disguise! Initially, we sought out after a jungle bungalow (my new word “jungalow”). 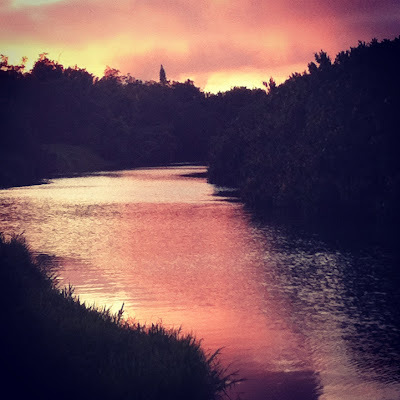 I’m talking hidden and secluded and surrounded by the abundant plant life that defines Kauai; often times petite studio-size houses on someone’s plantation, including outdoor showering/bathing facilities. Pete got to have his luxury in Maui, so I considered Kauai all mine. 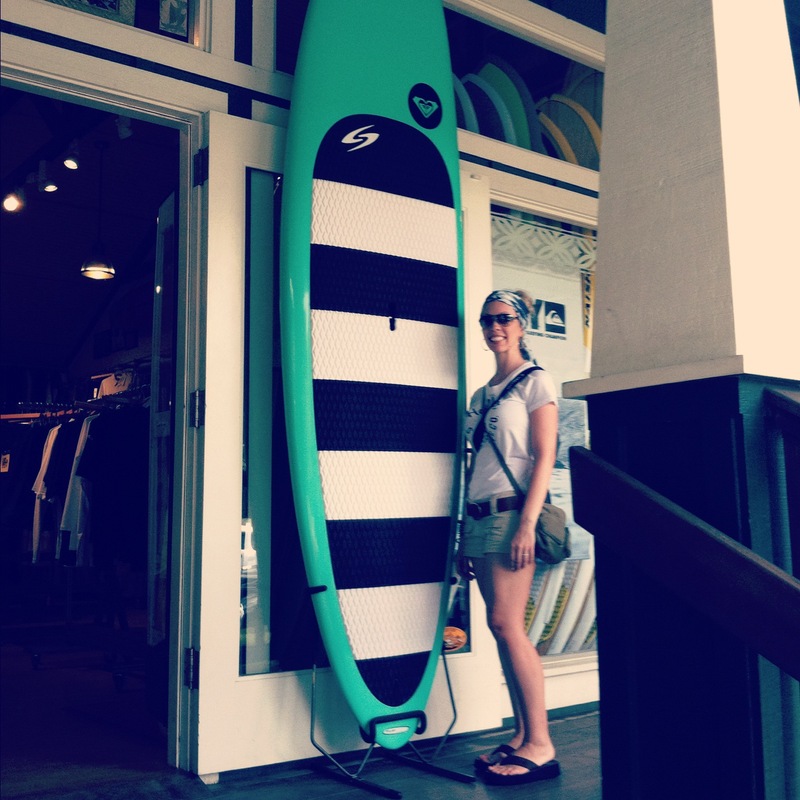 My intentions were to “rough it” and experience Kauai to the core. 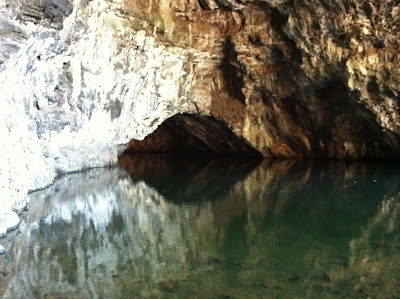 Apparently, we waited too late in the year to schedule these type places; owners reserve them for family visiting from the mainland or otherwise – availability was null. Pali Ke Kua seemed like just another condo, and it happened to be last on my list. To my surprise, it turned out to be utterly adorable, comfortable and incredibly spacious -- the kids could’ve had the entire upstairs to themselves. The unit immaculately maintained, equipped with a full kitchen, washer/dryer, as well as, all the beach tools we could possibly imagine. And most importantly, Joyce (owner) was a great wealth of information and included a hefty welcome basket that we were able to snack on in-between meals throughout our stay. 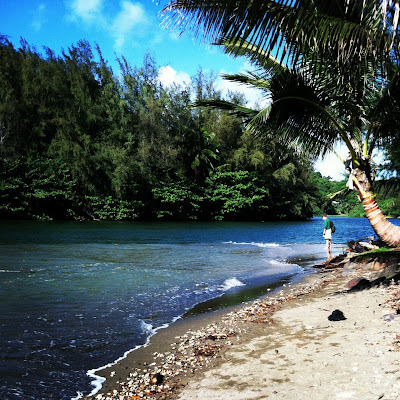 The Dolphin – A hugely popular spot in Hanalei…for good reason. I would make it a point to eat here again and again. The prices are a bit higher than I originally expected, but high-quality does come at a premium -- very knowledgeable, attentive, accommodating staff, as well as, a view of the river and the mountains. We found it most interesting to have a female sushi chef! Kalypso’s – The setting is similar to that of a beach bar; open-air; comfortable. The food was great and decently priced (for Hawaii) and friendly service. The breakfast menu looked quite appealing, but we simply didn’t have the opportunity to give it a whirl. Bouchon’s Restaurant & Sushi Bar – If I had only one word, it would be “prompt.” If you can snag an upstairs table near an open window, do it – great views of Hanalei and the mountains; otherwise, the restaurant décor is not much to look at. No complaints here about the sushi – tasty and generously sized! CJ’s Seafood and Steak House – Sit on the lanai in the evening and forget your worries! I ordered the Hanalei shrimp -- I literally wanted to lick it off the plate -- but reconsidered since we were in a public setting. Here's a BIG tip -- make sure that if you are ordering from the "Lighter Menu" – it doesn't mean lighter as in weight management, but rather a smaller portion. In addition, you get a self-serve salad bar with your entrée – that’s pretty dang good! Pink’s Creamery – the sign “Hawaiian Grilled Cheese” relentlessly haunted Pete’s mind – he HAD to have one! 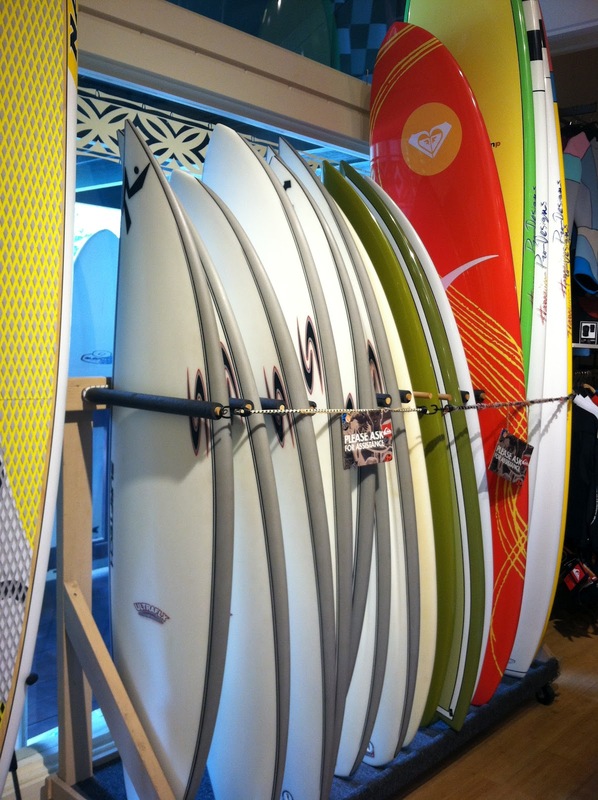 The storefront felt more like a hat shop and ice cream parlor that did sandwiches on the side, but the owner was so full of aloha spirit. 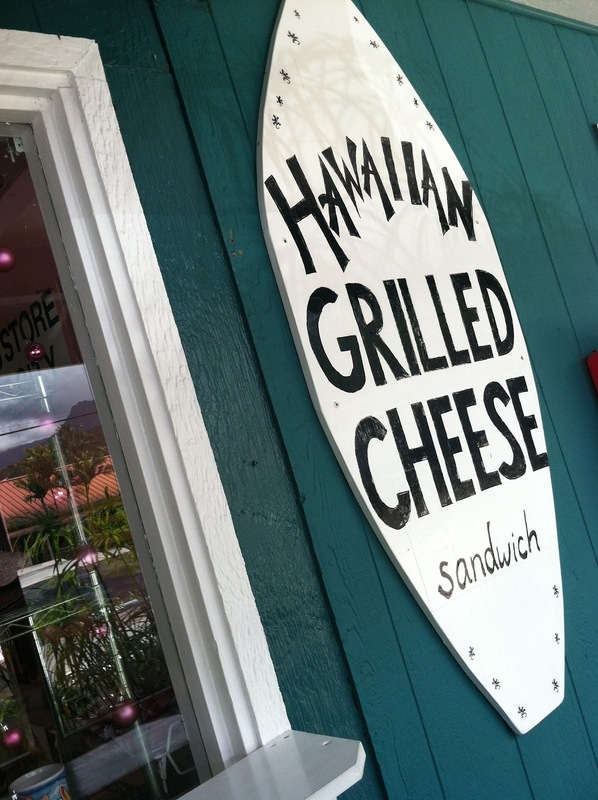 The “Hawaiian” grilled cheese is naturally served with muenster, pineapple, kalua pork, on sweet Hawaiian bread. Silly Pete ordered without the “Hawaiian” but still charged a whopping $9! Yes, seriously! Lappert’s Ice Cream & Coffee - All I remember is the smell of the waffle cones. I was like a character in a cartoon – I floated along in the air while my nose did the walking. Kona coffee ice cream with macadamia nuts – to die for! It is pricey, but at 5 percent higher butter fat than most ice creams and unique flavors like Coconut Mac Nut Fudge or Kauai pie, it is well worth the splurge. Where Maui is vast and spacious, five million year old Kauai is knotty and lush, with eroded spires of volcanic rock shooting up from dense jungles of palms and pines, bamboo and guava groves. Kauai was the setting for Jurassic Park, and in this prehistoric setting, it’s not hard to imagine a couple of raptors sunning themselves at your side on one of the soft, sandy beaches that circle virtually the entire island. Hmm…that was a lame description but you catch my drift. In spite of its extravagant spectacle, Kauai feels intimate. The towns on its ring road are small, and as that road nears an end on the island’s north side, it shrinks to cute, single-lane bridges over inlets and streams. Kauai is the northern and least developed island in the Hawaiian chain. It is mountainous and beautiful and famous for its rugged landscape. 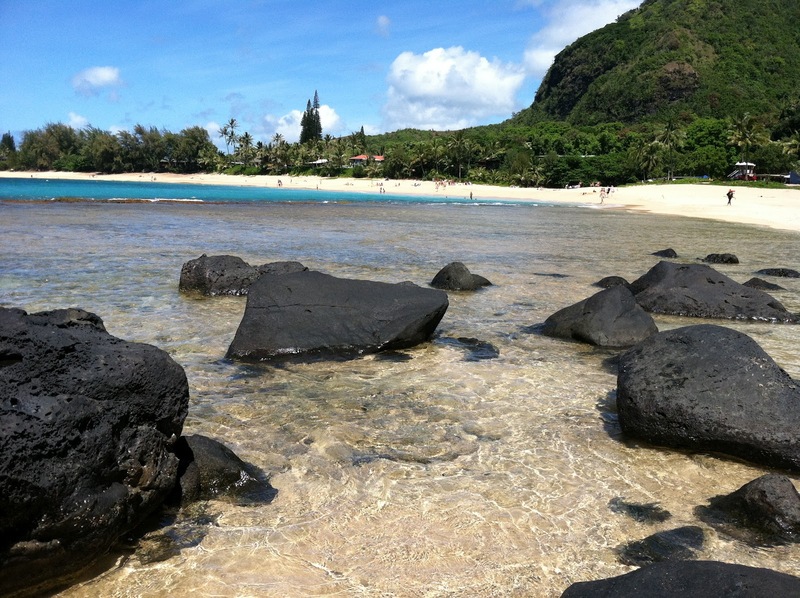 Kauai is geologically the oldest of the main Hawaiian Islands, also known as the “Garden Isle”. The island of Kauai has been featured in more than seventy Hollywood movies and television shows, including Jurassic Park (as I’ve already mentioned), Indiana Jones’ Raiders of the Lost Ark, Six Days Seven Nights, the 2005 remake of King Kong, Tropic Thunder, Pirates of the Caribbean: On Stranger Tides and many others. 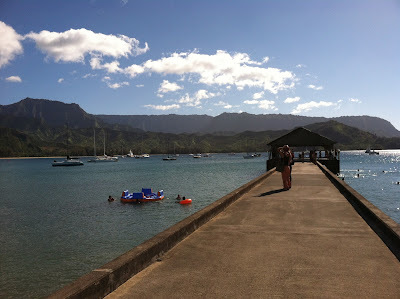 Hanalei and Haena are the two primary towns on the north side, and they are close to the trailhead for the Na Pali Coast. While they are my recommended places to stay, keep in mind that it does rain here more often. 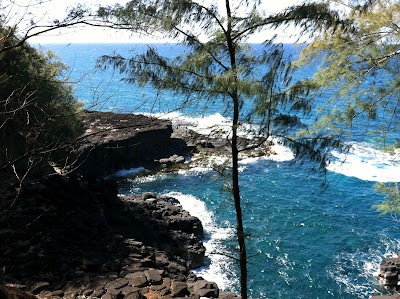 If you are the type that prefers golf, resorts, and sun bathing you might like the south side more, specifically Poipu. 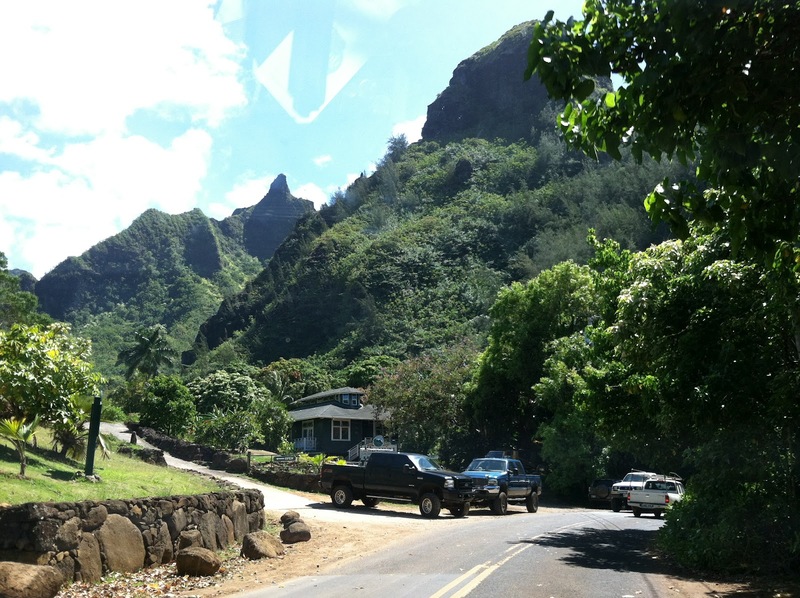 It’s still hard to believe we were actually in Kauai – nothing there at all seems real, and yet it’s all SO. REAL. The air is clean, fresh, unlike anywhere else surrounded by salt water. If you want highlights of the whole trip, you won’t find brief answers here on my blog. There’s much too much to describe about being on remote beaches, surrounded by incredible beauty, feeling like a hippie and of course, the views; vegetation absolutely exploding from every square inch of this volcanically twisted land. Hawaiian law says no individual or property owner can hog a beach for themselves — all beaches are public by definition. But the question of access to those beaches is a bit murky. For example, start driving around in the artificial (“planned”) community of Princeville and you’ll find signs all over the place reading “Parking for residents only.” But get close enough to the coastline and you’ll eventually find a much smaller, more subtle sign reading “Public beach access –>.” In other words, you’re welcome to use our beaches, but you can’t park within a mile of them. Then, once you start down the trail, you’ll find signs saying things like “Warning: Treacherous trail ahead. Slippery, steep, falling rocks, unstable soil. You’ll probably die a gruesome death if you choose to continue. Proceed at your own risk. This trail not maintained by the ABC condominium consortium.” Ignore the CYA signs written for trail wussies and continue. If you’ve already done the Kalalau Trail (written about in more detail below), these trails will seem like sidewalks in comparison. 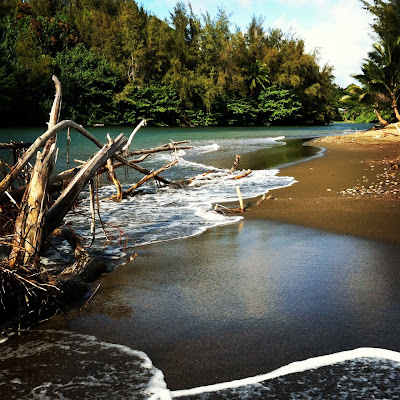 A lesser-known and lightly visited beach in Princeville, Pali Ke Kua (aka Hideaway Beach), was just 200 yards from our house, down a tennis court-side alley way. There’s a nice little surf break along the reef here, but good luck navigating your board down the narrow stair case path. 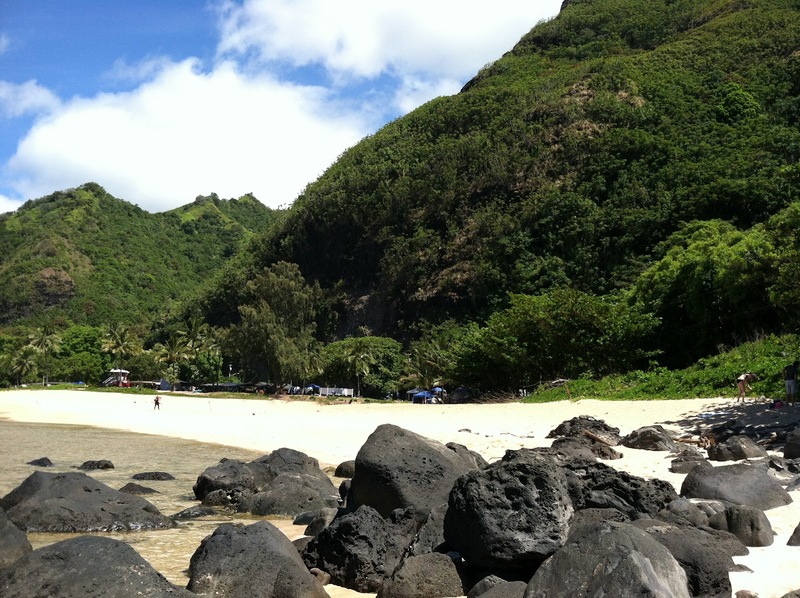 Queens Bath, also in Princeville, is a relatively popular landmark in Kauai. You’ll pass two very nice waterfalls on the way down. 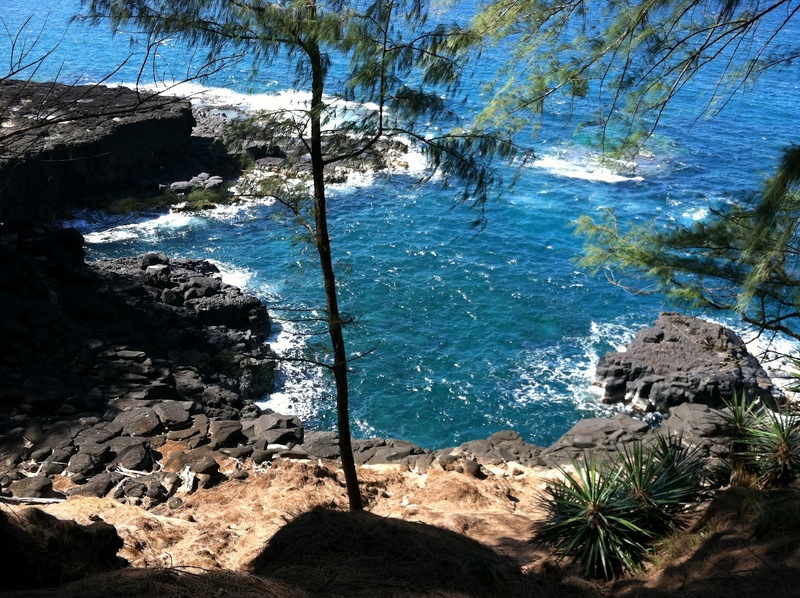 It is a tide pool about the size of a swimming pool, located below lava cliffs along a rocky shoreline. While beautiful, it’s also dangerous. Warning signs advise no swimming, as well as, the number of deaths that have occurred here. 28 known fatalities. The tide makes a huge difference – if you swim, you had better fancy yourself a great swimmer. It may appear calm for a 10-15 minute time period, and then a rogue wave comes in out of nowhere and flushes you out to sea, or otherwise, crushes you into the surrounding rock walls. Sea turtles are commonly seen here, but we only saw one. 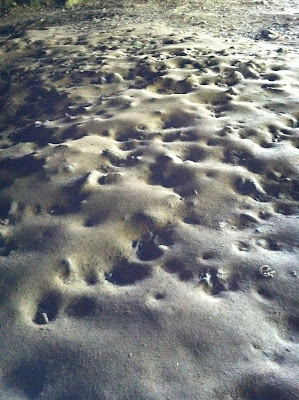 The north shore beaches were fairly traditional. On the half-hidden, pine-shaded sands of Kauapea Beach (aka Secret Beach) was a picturesque setting. Waves crashing, expanses of lonely sand, reels of filmic potential, the whole postcard. 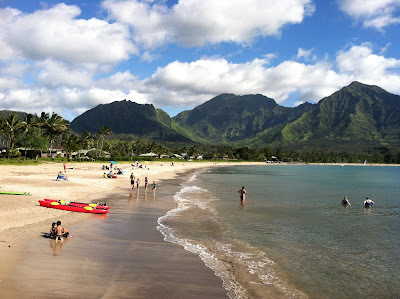 Hanalei Bay is a well-protected, wide-mouthed sandy bay just minutes from Princeville, where we lodged. I can still picture the vast number of surfers, SUP boarders, and several outriggers drifting by. 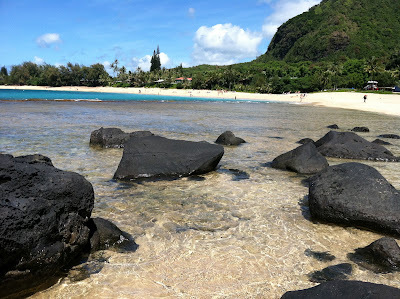 The water is clear to the bottom and fairly warm for Pacific waters – exactly the Hawaii scene we imagined -- the soup of life, where it all came from, kids ecstatic to be buffeted by small waves, sand ideal. When we weren’t at the water’s edge, we were hanging around the town of Hanalei, a short stretch of restaurants and shops that was as low-key and high-quality as you could hope to find on a tiny island in the Pacific Ocean -- perfectly convenient access to snorkel/surfboard rentals, shave ice, coffee and delicious island food. Kind of tough to feel blue in Hawaii though – islanders only get depressed when really bad things happen… like if their mango gets a bruise when it falls from the tree in the backyard, or if they only see one rainbow in a whole day. There is hardly a more romantic time than your honeymoon. And there is hardly a more romantic place to spend your honeymoon than on the Island of Kauai. With more miles of beach per miles of coastline than any other of the Hawaiian islands, you are sure to find perfection.